There’s no doubt I’m a fan of the great Genesis WordPress Framework. Design matters, and design can bring your blog down if it’s really horrible or makes a difficult reading (read how I increased my reader’s engagement in 5 minutes by changing typography) for your visitors. Whether you’re going pro or not, if you don’t have a premium theme, you’re starting with the wrong foot. While I’ve been testing a lot of themes lately, the Genesis Framework from the StudioPress guys is one of the best and that’s what I’m using at Stream SEO. This doesn’t mean I’m using it on all of my websites, since I like to test different services, but this is how I started after a good analysis and reading some reviews. First of all, let’s dive into the benefits of using a Framework and Child Themes on your blog. Basically, the Framework helps you build a base for your blog and makes it independent of the rest of the design. Your CSS and functions.php documents are store withing the Framework, and it acts like a Parent Theme. If there’s a Parent, there’s a Child. The child theme is the code that’s going to build the overall look of your design, without touching the basics. 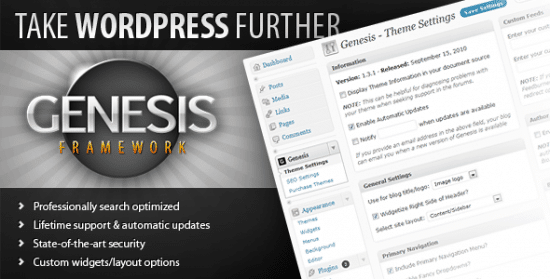 How to Review the Genesis WordPress Framework? Reviewing a WordPress Theme isn’t as easy as going to Studiopress Themes and copy the features shown on the Landing Page. I’ve been using the Genesis WordPress Framework for a year already, and I’ve done a lot of changes and experiments with it. There’s no magic behind a Framework. If you install the Genesis WordPress Framework on your blog, you need to install the parent child and after that, install the child theme. Otherwise it won’t work. Once you’ve done that you can go to the WordPress Dashboard and you’ll find the following menu below the Feedbacks menu. Let’s start with the basic menus and finish with the bigger ones, shall we? Once you install both the Genesis Framework and your child theme, you can go over the README section where you can find extra information from the Studiopress guys. First, you’ll find your child theme and the URL, along with some instructions to install it if you’re having troubles with the process. However, there’s also a deep explanation of the widget areas included with your theme. Read this information carefully if you’re looking to do some customization to your sidebar or if you’re planning to add some banners on it. The README section also lets you know the recommended banner dimensions and finally there’s a link to the support site at Studiopress. You’ll get access to this site after you’ve purchased your theme (parent or child). I’ve been there more than a couple of times and their response time is fast with a big community behind. Got more questions? Read me! This is a really cool feature included with the Genesis Framework. After you’ve customized your parent’s theme settings (including SEO) you can export and download a copy so that you can keep it safe on your hard drive. Of course, it also allows you to import a previous configuration (in the form of a .json file) so that you can recover your settings or use them in another blog with the same framework. That’s basically what you can do in this section. 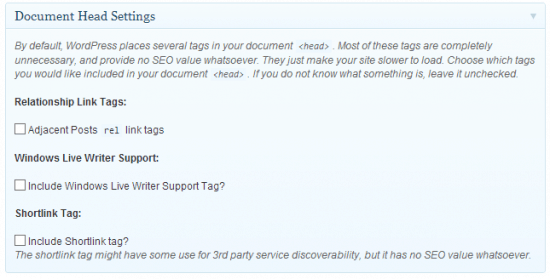 Needless to say, you can export both your Theme settings and SEO settings (if available). I’ll go over SEO later. Finally, let’s check the Theme Settings. Here’s where you’ll probably hang after installing your Parent’s theme, and where you’ll spend most of your time customizing your new blog. Don’t get me wrong though… after you’ve configured everything you need (and exported a copy on your local computer) you won’t have to visit this section anymore. The first part allows you to setup updates, color and feeds. The good thing about the Genesis WordPress Framework, is that you can update both parent and child’s themes with a click. No need to uninstall or disable any theme to do it. 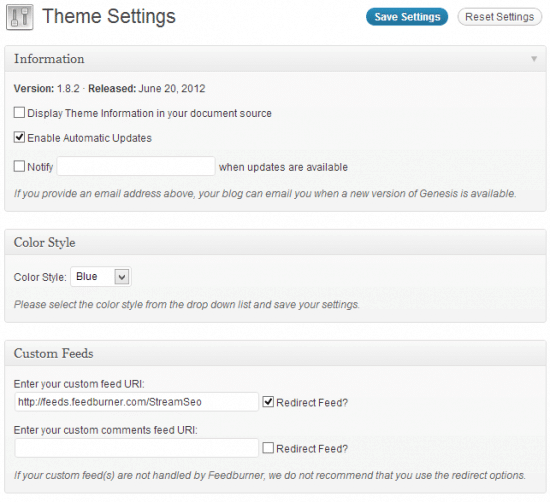 No need to manually download your new theme and upload it to your WordPress Dashboard. I’m giving an A+ here to Studiopress because compared to other WordPress Themes providers, this is the easiest installation/update process ever! They even give you the option to notify you by email before updating, so you can choose whether or not to update ASAP. The second option allows you to change your Theme’s color (this varies from Theme to Theme). Easy as that. The third part is about feeds. By default, your blog has a feed document, but if you decide to customize it (using Feedburner, for example), you can add the custom URL here and redirect your visitors. This also works for comments feed. Here, you can modify the layout settings and overall design of your website. However, let me go deeper here and tell you that you can choose different layouts for every post/page on your blog with a simple click. This option just sets up the default layout for your homepage. Then you have the navigation settings, where you can enable drop-down menus, include primary or secondary navigation menus and even enable extra things at the right side of your blog. 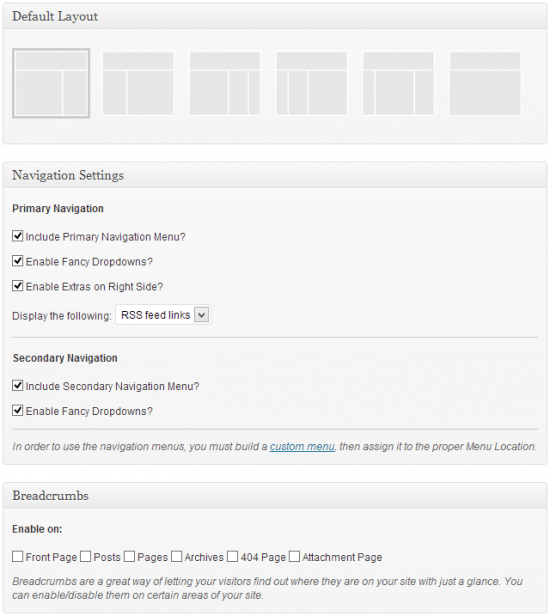 Finally you have the breadcrumbs menu to enable those on certain areas of your site. 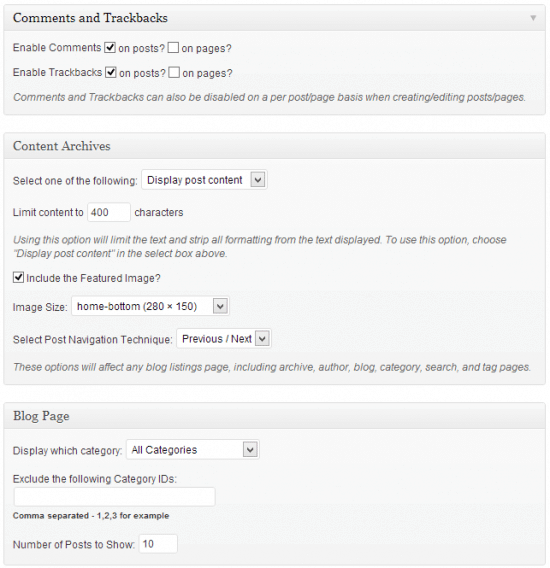 Here you can enable and disable comments and trackbacks on both posts and pages. Again, this is the default setting but you can change it individually every time you craft a new post/page. 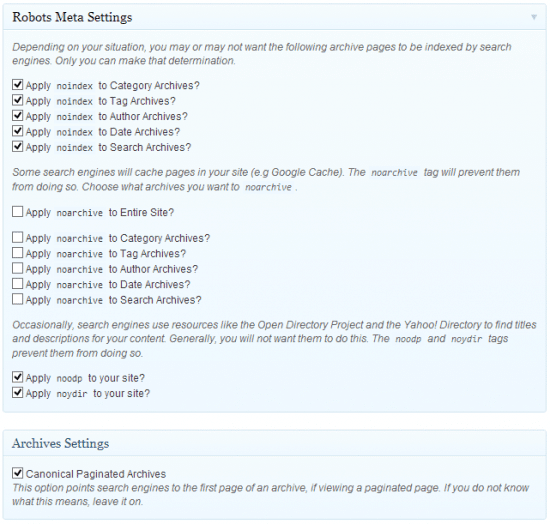 Then you have the ability to modify how your blog shows archives and content on the homepage. You can setup a limit of X characters and even the size of the features image. This is very useful when you don’t want to show the whole post on your homepage. Finally, you can choose whether to display all the categories on your homepage or exclude some of them, and finally, the number of posts shown on your homepage. Easy as that! Basically, here’s where the genesis WordPress Framework allows you to add some scripts or code in the header or footer of your site. 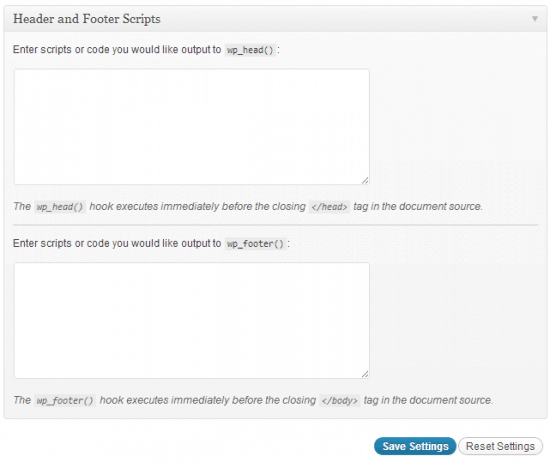 This is really useful to add your Google Analytics or any similar code to your blog. However, I recommend doing this with a plugin instead. You didn’t see the SEO menu on the first image of this review on purpose. I wanted to show you, that having SEO settings on the Genesis WordPress Framework isn’t bad or intrusive at all. If you install any SEO plugin (I use WordPress SEO from Yoast), your SEO settings will disappear from the Framework so you can focus on the plugin you’re using. Isn’t it cool? 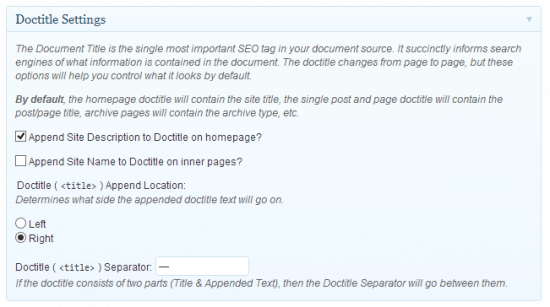 First you have Doctitle settings, which by default you should leave them as they’re. This contains the site title, post/page title and archives. 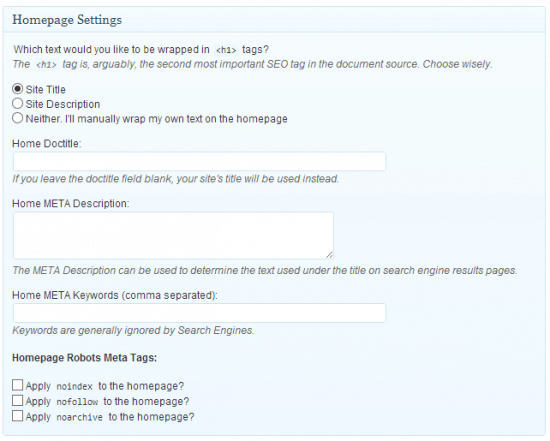 Here, you can choose which text will be wrapped on <H1> Tags (valuable for SEO), modify your own Home META description and keywords. After that, you can modify your Document Head settings to include short-link tags, real link tags and support for Windows Live Writer. If you don’t know anything about those tags, leave them unchecked. Other than the settings from the Genesis Menu, you’ll find some extra stuff on your Widgets area. You’ve got some new Widgets with Genesis too! All of them allow you to improve your experience by adding widgets you wouldn’t have without the genesis framework. Some of them can be downloaded from the WordPress plugin directory. I’ve marked a few just to show you what kind of customization you get with the Genesis Framework. There you can add banners, ads, scripts, plugins, etc. with just a few clicks. By default, most child themes have 2-3 areas for banners and the possibility to edit the footer in 3 different areas. However, using a Framework can initially cost a lot more. By default, any Genesis Child theme costs $75 (framework included), but later you can buy additional themes for $25 because you already have the Framework. It’s all about how much you want to spend and how far you want to go on your website. For now, the Genesis Framework has worked great for my needs, and many people love the design of my blog. I even changed my typography and spacing in less than 5 minutes within the CSS without messing with the child theme code. Enough said, I really recommend using a Framework to enhance your performance, stability and reliability. Studiopress has got a lot of child themes for your needs. So no matter if you’re building a business website or a personal blog, they have you covered. The only niche where I think they’re still lacking of child themes, is within the WordPress eCommerce niche. However, there’s an alternative right from Elegant Themes here. I have used them before, but I prefer the Genesis Framework unless the site requires some specific functions from a themeforest theme. This is important article for webmasters like me who are using wordpress for maintaining their sites. Please tell me how to install a framework on an existing wordpress site that is live and stable for 3 years? I really appreciate your time! Thanks. Nice review on Genesis Framework. Personally I played with Thesis 2.0 recently and damn, it doesn’t come close to Genesis at all. Okay, I have been with Genesis for over 2 years now and maybe I am biased. Even though there are lots of new updates from Thesis, Genesis makes it easier for newbies especially. Worth it and highly recommended! I always had the idea of trying Thesis and but there are some things that I didn’t like at all. Now with Genesis 2.0 I’m even happier and just waiting for some new themes being launched to buy more. Hi, thanks again for helping me out some time ago. I am still very happy that I made the decision to use Genesis. I have one more question, hope you can help me out: I know that it is possible to use purchased Child themes on other WordPress websites. But is it possible to use my purchased Genesis framework also for two other sites that I own? Or do I have to buy the Genesis frameowork again to use it on my other website? Thanks for your time! Hey! No problem. Im glad to help. With the genesis framework you can use everything on every page. All their licenses are for developers. No need to buy different packages or subscriptions. So go ahead! Yup! one of the many reasons I still consider the Genesis Framework before any other, including Thesis or Elegant Themes. Don’t forget to share your new blog when it’s finished! Silva, Genesis is really awesome WordPress Theme Framework with Great Scope for Design & SEO. Initially it took some time to configure child theme’s on it as like with any other WordPress theme, but later on it’s very simple. Yeah. You need to get used to it, but it won’t take more than a few hours or days until you eventually dominate it. That applies for all frameworks and themes, so I wouldn’t be worried about it. Before I installed Genesis, I wrote a post and decided myself where I wanted to add the “read more” tag. I don’t want to include the Featured Image, so I have disabled that in the Theme Settings. I just want it the way it was before: blogpost with text and image only within the blogpost. I gues I have to figure that out tomorrow. Will keep you updated! 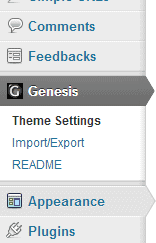 Go to your Dashboard and Open the genesis Theme Settings. Then scroll down to “Content Archives” and then change “display post content” to “display post excerpts”. Also, try disable the “include the featured image?” option while you’re there. Hi! thanks for the great review! 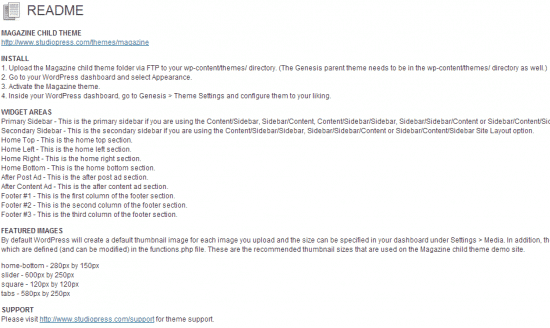 very helpfulI am about to install the genesis framework with a child theme on my excisting wordpress website. After browsing the internet to find some useful tips and help I just can’t find anything that can help me out. Maybe I think too much but I just want to know what happens to my current wordpress theme, post, pages, plugins, etc. when I install the genesis framework. Maybe I just have to go for it and install genesis and the child theme. Ofcourse I have made a backup of my database and all files. I just wants to be sure that it will go smoothly. What are your thoughts about that? Thanks for your help. Hello. Great move! Backing up is very important. All your pages, posts and plugins will remain the same. Don’t worry. However, I recommend you to move your sidebar widgets to the inactive section because if the new theme has a different layout, you could lose them. Other than that, the process is really simple. Install the framework first and then your child theme. That’s a great Theme for sure. Please let me know if you have any further question and don’t forget to read the “how to” file in mystudiopress section so you can setup everything as seen on the demo. Well, I guess you can use excerpts on that one. I guess you’re adding the “read more” tag directly on each one of your posts, so the best thing would be to go to the Genesis Framework and select to automatically get excerpts and set a words limit. Great review, I’m considering change of theme for Thesis or one on Genesis Framework. Which one would you choose? I’d choose Genesis, because I like it more. Don’t get me wrong though, I know both Frameworks are great, but I’ve read the latest version of Thesis is a little bit more difficult to use. And I also prefer Genesis because it’s being developed by the “Coppyblogger team”, and offers integration with Hosting Services, Landing Pages and SEO Tools.